Section 1 basketball is a lot like a Chinese takeout menu. On the left are the big, big schools like New Rochelle, White Plains, and Port Chester. They play in what New York State calls Class AA and what Section 1 says is Conference 1. Go figure. Flip a few pages of that menu and you’ll find the small-enrollment Class B and C teams. (Or Conference 3, if you’re a purist.) In our area, Blind Brook, Keio, and Rye Neck all play basketball in Class B. In between are the 29 Class A squads. Like the section that lists a variety of chicken, beef, pork, and shrimp offerings, Class A boasts teams as far north as Poughkeepsie, as far south as Mt. Vernon, Rockland County contingents—even an all-Yonkers grouping. 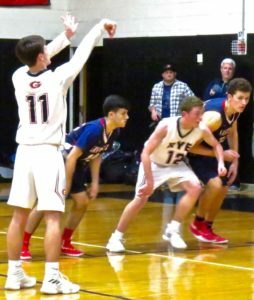 Rye High shares a league with perennial power Byram Hills and three perennial, well, hopefuls: Eastchester, Pelham, and Harrison. So, getting three straight home wins against Eastchester, Pelham, and Harrison this past week was nice. Necessary, even, if Head Coach John Aguilar’s boys are to stay in the league’s title race. But a glance at the standings tells a challenging tale. Byram is unbeaten after five games, with a 13-3 record overall, a big rebounding center in Ben Leff, and players who can shoot from all over the court. The Garnets, possibly the fastest quintet around, play stifling defense and are in second place at 3-2, their overall record a tidy 12-3. Eastchester is third against all comers at 11-4, 2-2 in the league, while Pelham and Harrison bring up the rear. Each has only a solitary league win. Quinn Kelly nails a free throw as Ryan Lopp (12) fights for position. A victory down in Pelham would have given the Parsons Street contingent a chance to share the league lead when they take the floor Friday. Instead, the best they can do is tighten the gap. And it wasn’t a cinch getting here. Thursday’s 59-52 win required great defense by kids off the bench. And the backcourt pairing of Quinn Kelly and Matt Tepedino had to can 15 fourth-quarter points after being down by 11 in the second half. Kelly would finish with 27 on the night. Friday’s defeat of Pelham was a slightly more expected 58-48 decision, with the Quinn & Matt Show combining for 30. But Tuesday night against Harrison was especially tough. Though the Garnets beat the Huskies 53-43 to retain the Michael Ice trophy earlier this month, this time their shooting was ice cold, like the weather. 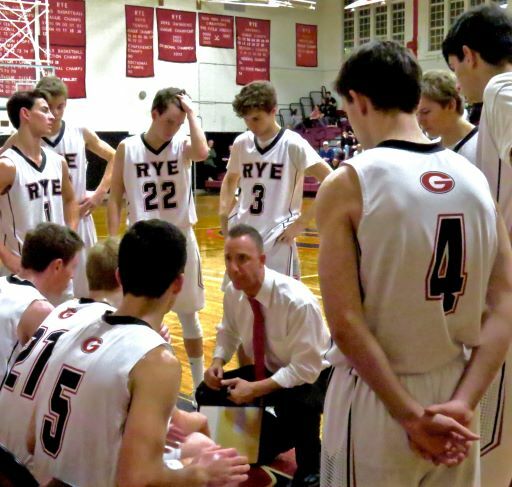 The fact that Rye could go only an infinitesimal 4-31 from beyond the arc and still win the game 42-37 is a credit to Coach Aguilar’s shifting defenses. No player on the winning side hit double figures. Zack Rosenstadt had nine points to lead Rye. So, will the 13-3 Garnets regain their collective shooting touch in time to topple the 13-3 Byram Hills Bobcats? Rye fans hope they’ll deliver.